by Ron Wolfson, Nicole Auerbach, and others. The Kripke Institute Center for Relational Judaism, 2018. “It’s all about relationships.” This conviction underlies all the wisdom and practical tools that fill this resource from veteran “relational engagement” practitioners. Based on their own experience, secular and Christian sources, and grounded in scripture and tradition, the authors create a guide for transforming organizational life from program-driven to what the authors call “engagement-driven”: Making people feel welcome and fostering connections among leaders, one another, and “Jewish life itself”. 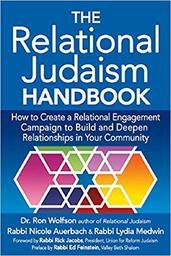 The handbook has three sections, Connecting with Jewish Experience (“Why it’s Worth the Effort”), Connecting with the Relational Community (tools that work), and Connecting with Each Other (nuts and bolts of small group organization and leadership.) Chapters within each section feature case studies and stories of best practices from model organizations. Chapters conclude with a “Takeaways” reflection guide and space for recording next steps. Visually pleasing and easy to navigate, the Handbook is written for professional and lay leaders.